Earlier in 2010, a team of PhD students from the Geography Department at Royal Holloway, University of London received a grant from the Creative Campus Initiative Cultural Olympiad to create a visual exhibit. Using the 2012 London Olympics as inspiration, the project crossed disciplinary boundaries and created a short film about London’s unique waterways and their role in building perceptions of the city. 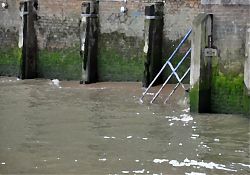 The Thames, which has been referenced in countless books, poems and visual representations, dominates geographical imaginations of the city; however, this project will acknowledge that London is home to at least 15 other rivers, a few of which are being radically reformulated in light of the forthcoming Olympic games. London is a city of water, a waterscape, making the aquatic components of the Olympic Games of deep cultural importance to the city. London’s waterscape is also a mobile proposition, a landscape of shifting ideas and places, of constantly changing uses and cultural perceptions. This project initiated an interdisciplinary exploration of the connections between London, water, culture and the Olympics in order to build a visual record of the past, present and potential futures for London’s various hidden and visible waterways. For more information about this project, please email Bradley L. Garrett , the project co-ordinator or have a look at the project website.